Prince Charles spoke to a number of soldiers who are recovering from their ordeal on the frontline when he toured the Edinburgh House personnel recovery centre in Scotland. 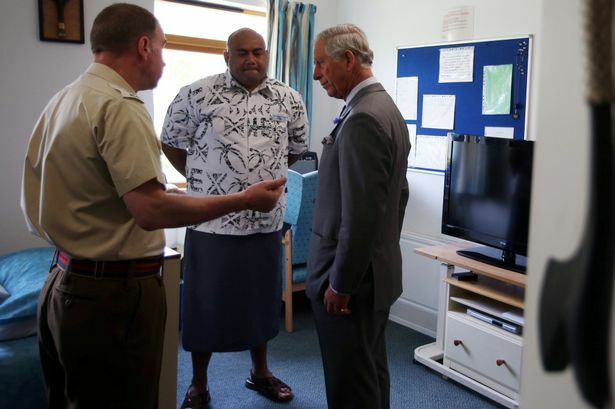 The Prince of Wales also spoke to a former Fiji resident, John Vuatalevu, 35, who is recovering at the centre after breaking his leg during service in Canada. Vuatalevu who has served for 11 years in the Army, said he was proud to have met the Prince. He added: “It was really a special day for me. To meet him in my room was really exciting for me. He walked in and said, ‘Finally you guys find a Fijian’. We started talking and he said he was really proud that I am serving. 2 Responses to "Fijian soldier proud to meet Prince Charles"
Malo ehh… ke o a kaya sara kina medua a wetatou jet me veikau ki VB…LOL..